The Irish Water Spaniel is acknowledged to be a very old breed, but as is the case with so many Irish dogs and horses, it is impossible to separate fact from folklore and the exact date of origin cannot be established. It is believed to be a descendant of the old Portuguese Water Dogs and Spaniel root stock that came to Ireland from the Iberian Peninsula. The lineage can be traced back to the period, centuries ago, when the large and important Spaniel group was divided into the Land Spaniels and the Water Spaniels. The Water Spaniels included both the Irish and English varieties of water dogs. The Irish Water Spaniel was developed in Ireland from two different strains – the Southern County Water Spaniel and the Northern County Water Spaniel. Both were distinct types in size and colour, however today's Irish Water Spaniel more closely follows the Southern type. The earliest record of Irish Water Spaniels in Australia is 1891. Irish Water Spaniels can live up to 12 years of age. Beneath its livery of brown curly ringlets, with topknot of twisted curls hanging down over its eyes, you will find a true Irishman – full of life, with a comical nature and great intelligence. 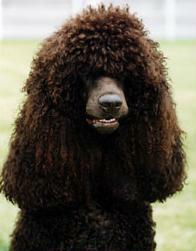 The Irish Water Spaniel enjoys human companionship and will want to become one of the family. Needs to grow up with the animals it might live with. The coat with its crisp curls does not present the problem that might be expected, however, it should be thoroughly combed with a wide toothed comb at least once a week. Eyes, ears and toenails should be checked regularly. A good swim or spray down will bring back those lovely curls. Irish Water Spaniels do not shed loose hair and can therefore be recommended for people who may suffer from allergies. Although this breed is easy to train, and is very quick to learn, it can become easily bored so avoid overtraining. For families and individuals that want a dog a little bit different than the rest of the pack.